In recent years, Malaysia’s Department of Wildlife and National Parks has killed almost 250,000 monkeys in every state in peninsular Malaysia. The monkeys have been deemed pests because of their large numbers and their ability to easily adapt to any urban environment. The target of the massive extermination has been the long-tailed macaque. Long-tailed macaques are only one of several species of monkey commonly found in Malaysia. The long-tailed macaque, also known as the crab-eating macaque, is a small, mischievous monkey with an extraordinarily long tail. They are commonly found throughout the islands of Southeast Asia and mainland Asia. Long-tailed macaques prefer forests near coasts or rivers, but can adapt to almost any environment if necessary. They are frugivorous, which means they dine primarily on fruit when available. However, long-tailed macaques will also east crabs, frogs, shrimps, bird eggs, grass, seed and anything else they can find. In Malaysia, they commonly beg for food from tourists and sneak into open homes and gardens to steal food. The proboscis monkey is one of the largest monkeys in Asia. Males can grow to weigh as much as 50 pounds. Proboscis monkeys are native to the island of Borneo (part of East Malaysia) and rarely stray from their jungle trees. They live in harems, which consist of a dominant male, two to seven females and their offspring. Proboscis monkeys eat seeds, leaves, unripe fruit and the occasional insect. In recent years, deforestation has destroyed much of their natural habitat and turned them into an endangered species. Silvered leaf monkeys are small monkeys with long tails and silvery fur. They live in the mangrove and subcoastal forests on the Malaysian Peninsula. Silvered leaf monkeys are arboreal, which means they stick primarily to trees, leaving only when they have to. Males usually live alone, with a group of all males or with a group of all females. Silvered leaf monkeys have a preference for young, tender leaves, but have been known to eat fruit, seeds and flowers. This species of monkey is not endangered, but it has been considered threatened since 1996 because of habitat destruction. The pig-tailed macaque is a small monkey with olive-colored fur and a short, half-erect tail reminiscent of a pig's tail. This species is found in several parts of Malaysia. 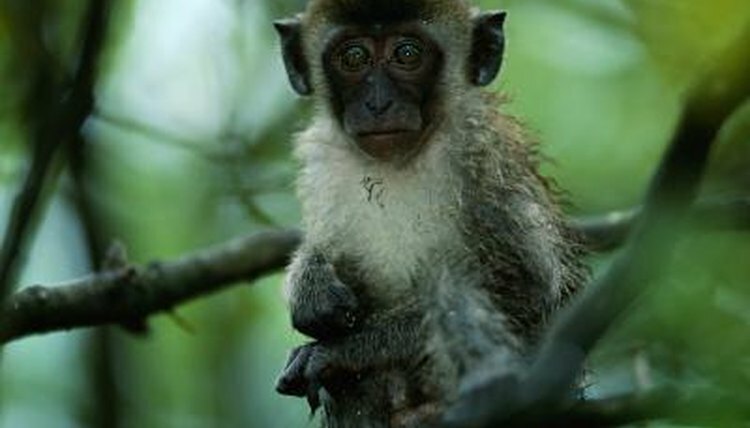 Pig-tailed macaques prefer lowland and hilly rain forests, but have been known to live in swamp forests on occasion. Their diet consists mostly of fruit, but these monkeys will also eat seeds, leaves, insects, fungus and even dirt. Pig-tailed macaques often live and travel in large groups and frequently raid farmers' fields in Malaysia. One of the group usually acts as a lookout, while the others steal food. Some farmers capture and train pig-tailed macaques to pick coconuts and other high-hanging fruits. International Primate Protection League: Malaysia’s Monkey War: Take Action!